Kauto Star, trained by Paul Nicholls and ridden by Ruby Walsh, won the blue riband of jumps racing, the totesport Cheltenham Gold Cup. Sublimity, trained by John Carr and ridden by Philip Carberry, won the Smurfit Kappa Champion Hurdle in great style. Voy Por Ustedes, trained by Alan King for Sir Robert Ogden, and ridden by Robert Thornton won an action-packed Queen Mother Champion Chase. Inglis Drever ran out a thrilling winner of an incident-packed renewal of the Ladbrokes World Hurdle, the feature race on the third day of the Cheltenham Festival. Philip Carberry, who rode the Champion Hurdle winner Sublimity on Tuesday, signed off at the Cheltenham Festival in fine style by driving home Pedrobob (12-1) to win the Vincent O'Brien County Hurdle. Drombeag fought back into the lead after the last to hold after a gallant challenge from Whyso Mayo in the Christie's Foxhunter Chase. Wichita Lineman, trained by Jonjo O'Neill and ridden by Tony McCoy, won the Brit Insurance Novices' Hurdle at the Cheltenham Festival. Katchit, trained by Alan King and ridden by Robert Thornton, won the JCB Triumph Hurdle, the opening race on the final day of the 2007 Cheltenham Festival. A partnership that was reformed earlier this year struck at the Cheltenham Festival today when Oscar Park won the final race on day three of the meeting. The Johnjo O'Neill trained, J P McManus owned Butler's Cabin (33/1) won the National Hunt Chase Challenge Cup for amateur riders under the guidance of Mr Alan Berry. The Venetia Williams-trained Idole First, who won the Coral Cup in 2005 , made an impressive comeback to win The Racing Post Plate in good style, in the hands of Alan O'Keefe. The Paul Nicholls-trained Taranis sailed over the last fence in front and managed to hold on from a rejuvenated Our Vic and a brave Billyvoddan to win the Ryanair Chase. L'Antartique benefited from a supremely well-judged Graham Lee ride to land odds of 20-1 in the Jewson Novices' Handicap Chase at the Cheltenham Festival. Denman, trained by Paul Nicholls and ridden by Ruby Walsh, led from start to finish to win the Royal & SunAlliance Chase. Massini's Maguire gave the Philip Hobbs team a fine start to day two of the Cheltenham Festival when causing a 20-1 upset in the opening Ballymore Properties Novices' Hurdle. Burntoakboy, owned by Dr Richard Newland and ridden by Sam Jones, won the Coral Cup in fine style in front of Powerstation (12/1), BaronDe Feypo (20/1) and Oscatello (8/1). Cloudy Lane gave first-season trainer Donald McCain junior his first Festival winner with his first runner when taking the Fulke Walwyn Kim Muir Challenge Cup Handicap Chase at Cheltenham for amateur riders. Cork All Star landed odds of 11-2 in the concluding Weatherbys Champion Bumper at Cheltenham for the Jessica Harrington team. The Alan King-trained My Way De Solzen, top class over hurdles and victorious in the Grade One Ladbrokes World Hurdle at last year’s Festival, showed all his class in winning the two-mile Irish Independent Arkle Challenge Trophy Chase. Trainer Willie Mullins got the Irish challenge off to a great start courtesy of Ebaziyan in the opening Anglo Irish Bank Supreme Novices’ Hurdle. Martin Pipe-owned Gaspara made most of the running in the Fred Winter Juvenile Novices'Handicap Hurdle under Andrew Glassonbury to notch up David Pipe's first ever Cheltenham Festival winner. Heads Onthe Ground maintained Enda Bolger's magnificent record around the cross country course by grabbing gold in the Sporting Index Handicap Chase at Cheltenham to provide Nina Carberry with a second Festival success. Joes Edge, the 2005 Scottish Grand National winner, got up to win in a photo finish with co-favourites Juveigneur and Distant Thunder. 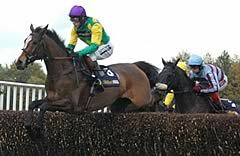 Champion Tony McCoy, with 18 wins to date, is the most successful current jockey at The Festival. Since partnering Kibreet to success in the 1996 Grand Annual Chase, the record-breaking rider has gone on to land a further 17 successes, with two of his greatest triumphs coming in 1997 through a rare big-race double aboard Mr Mulligan in the totesport Cheltenham Gold Cup and Make A Stand in the Smurfit Kappa Champion Hurdle two days earlier. For three extraordinary days in the middle of March the National Hunt racing community from all around the world converges on the elegant spa town of Cheltenham. The twenty races are the most hotly contested of the entire racing calendar with more than £2 million in prize money and £20 million in bets riding on these Championships.